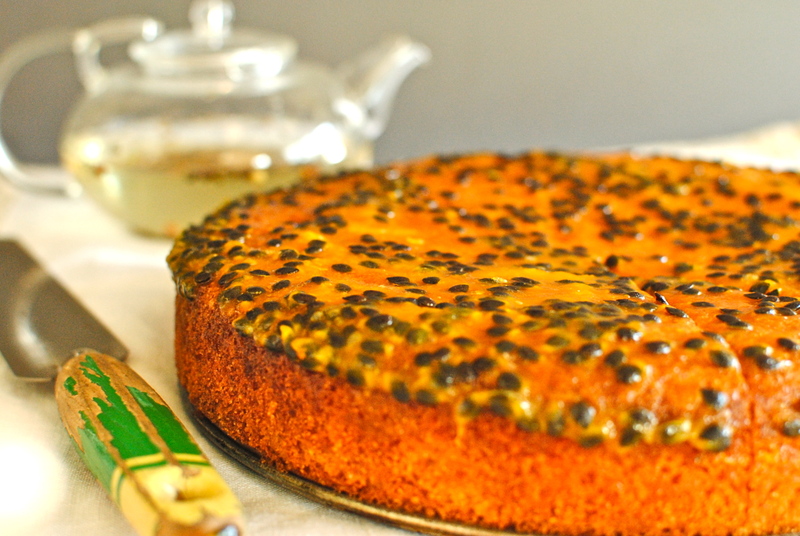 That’s quite a lot of ingredients in a title, isn’t it: Green tea, lime, passion fruit AND polenta. What I didn’t mention was the olive oil, lime leaves and the almonds. No kitchen sink though. It’s just that I couldn’t decide what ingredient to emphasise so I typed them all down; I hope that doesn’t put you off. It sounds a bit fussy, I know, but I promise you it is anything but. 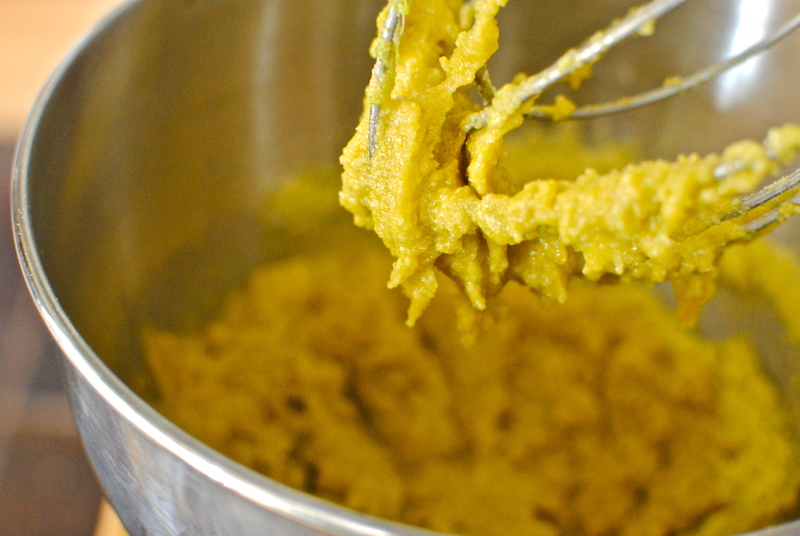 If you have ever made a polenta cake, you know that this will be easy. If you haven’t, please just trust me. You won’t regret it. 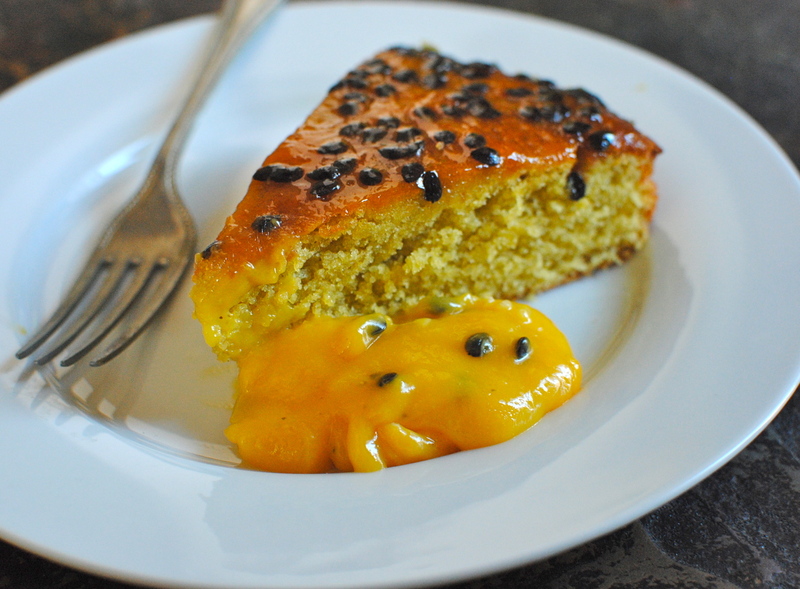 It easily works as a dinner party pudding when paired with the fresh passion fruit curd; an easily-kept, lunchbox-friendly cake on it’s own; or maybe even a fresh and zingy alternative to the traditional simnel or chocolate cake this Easter Sunday. Other than the pick and mix assortment of flavourful ingredients I also have a tweak that I think makes this cake as light as any containing flour, of which this cake has none. And I even have Claudia Rodin‘s blessing. Well, not directly of course – that would be a no-brainer blog title: I Got Thumbs Up From The Iconic Cooking Goddess, Claudia Roden. What actually happened was I was listening to an interview with her on BBC Radio 4’s Woman’s Hour (old-fashioned title; great show) while actually making this cake for a nutrition class (spooky, huh) and she was discussing, among other foodie Spanish things, her almond cake (no polenta). She mentioned, in her beautiful Middle Eastern/French accent, how she separates the eggs, folding in the stiff whites to lighten the batter. I do that too and it really does give verticality and airiness to what should be a gloriously stodgy cake. And it can still be made enticingly heavy and puddingy if you soak – and I mean soak – it in sweet syrup. But I have gone all modern with this one and ditched the traditional Mediterranean, almost baklava-like sweetness, opting for seasonal freshness from super zingy passion fruit. I hope you approve. 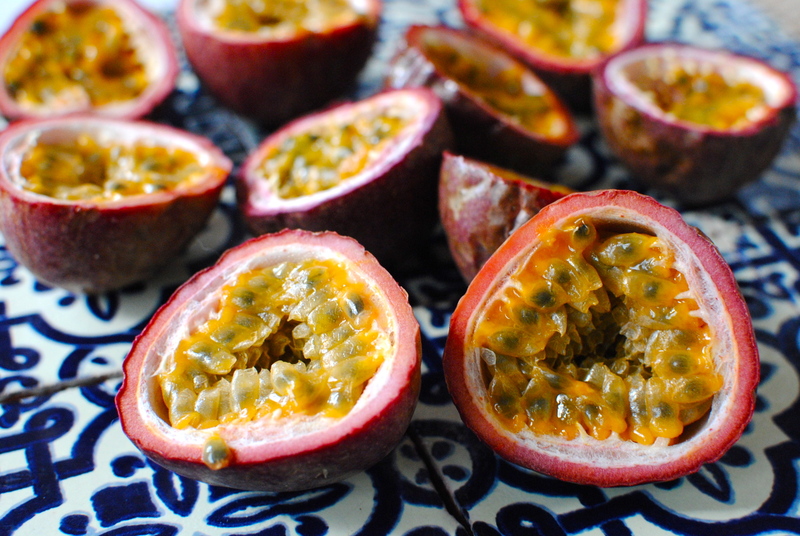 And passion fruit, the most beguiling and intensely scented of any fruit, is my favourite. Despite the unpromising leather jacket and the poor ratio of seeds to flesh (pulp really), the passionfruit more than pulls its weight in flavour and colour. I love it best scooped straight out of the skin – seeds and all – and into my gaping maw, baby bird style. But I also like it mixed with Greek yogurt for the simplest of puds, in banana bread, in Asian noodle dishes, on pavlovas and in salsas. The strained juice is magical when added to soda water – or a cocktail. It is astonishingly versatile, probably because it isn’t too sweet or too sharp. Nutritional Information: Sharp-sweet and heavily perfumed Passiflora edulis is certainly not local to these parts, originating in South America but also cropping in the US, South Africa and Kenya. But I don’t mind buying these non-local fruits because they are available when nothing else is doing in the fruit department except cold-storage apples. And their high hit-rate of nutrients makes it even more of an attractive proposition: Vitamins B2, B3, C, beta-carotene, potassium, iron, magnesium, phosphorus, zinc and fibre. Incidentally there are two main varieties: the purple ones are higher in Vitamin C and sold as produce, whereas the yellow skinned ones fruits are higher in beta-carotene and sold as juice. 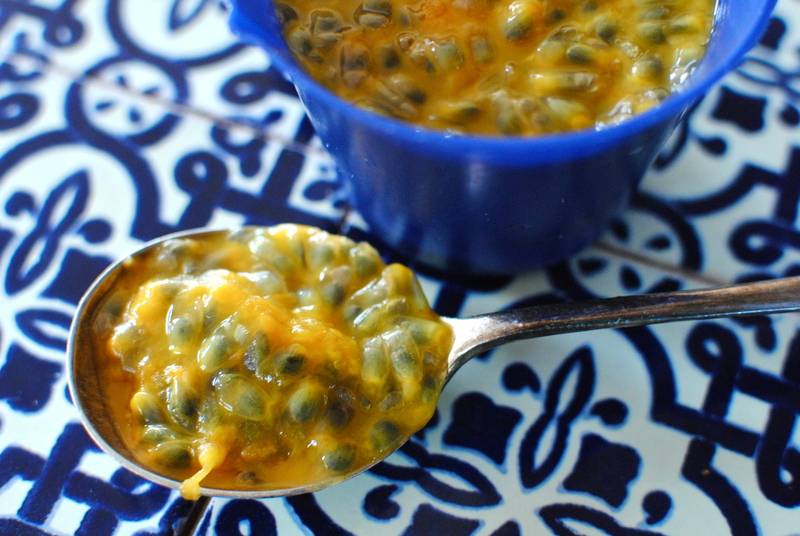 And lastly, cool fact of the day, passion fruit juice has a slightly sedating effect, and is highly prized by Brazilian mothers for just this reason! Buying and Preparation Guide for Passion Fruit: Pick deeply wrinkled fruits – the heaviest and largest examples – as this should indicate a decent juice content. If you can only get smooth ones they will ripen up in a few days at room temperature. Otherwise store passion fruit in the fridge. To prepare, just cut in half and scoop out the seeds and orange, pulpy flesh. If you don’t want to eat the seeds, or if you can’t tolerate them, just press both seeds and flesh in a sieve. Not very much juice will pass through but it will be highly flavoured and aromatic. For actual juice, you will have to press a heck of a lot of passion fruits and I would just go for a best quality bought juice or go to a juice bar where they have clever machines to do all the work for us. And, starting from now I will be asking my music-mad daughter, Rachel, to recommend a piece of music to go with the recipe – either the making of or eating. She has an eclectic musical palette but I trust her judgment implicitly. I really hope you like her sizzlin’/cookin’/smokin’ tracks. What’s your favourite fruit? Do you like it best ‘straight’, or in a recipe? What fruit are you most looking forward to eating come summer time? 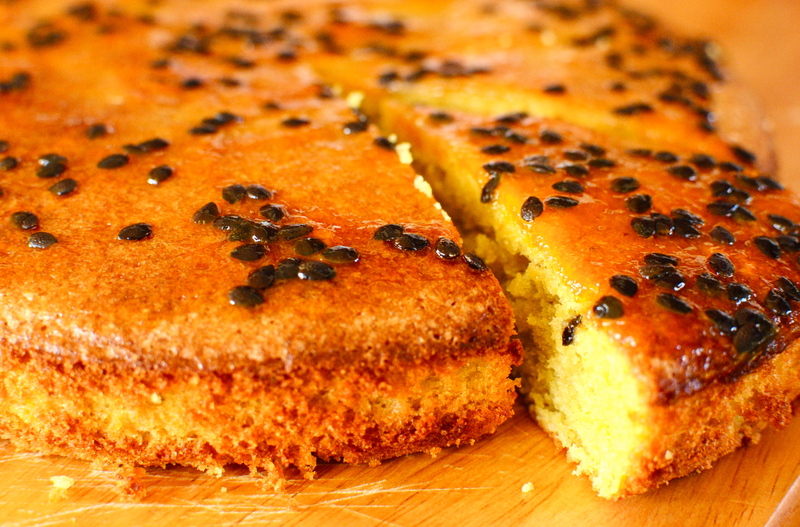 A fine cake for Easter Sunday or any Spring day, when passionfruits are in season and at an (almost) reasonable price. 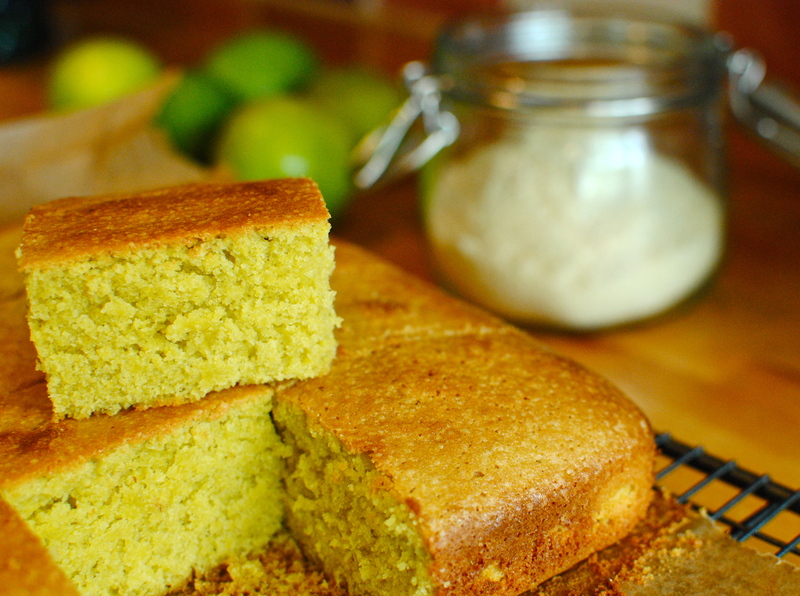 And don’t worry if you don’t have the matcha green tea; although it gives a subtle taste and gorgeous glow to the cake, it is absolutely fine without it. Some of my photos are without it. Same goes for the lime leaves. Grease and baseline with baking parchment a 24cm diameter springform pan or well-oiled and lined square tin. Preheat the oven to 150C/140C fan/300F. Using a stand mixer, or handheld beaters and a large bowl, whisk the egg yolks and sugar for at least five minutes – until very smooth, thick and pale; add the oil, vanilla, lime zest and green tea powder (if using), whisking a further three minutes. In a separate bowl – with very clean beaters – whisk the whites until firm peaks form. Set aside. Measure the fine polenta, ground almonds, baking powder, bicarbonate of soda and salt into a large bowl and, using a balloon whisk, mix very thoroughly. I do this instead of trying to sieve such coarse ingredients. Gradually work this into the wet mixture, adding the lime juice at the last few strokes – it should react a bit with the bicarb by getting a bit airy. Now fold in one large spoonful of the whisked whites, really working it in to loosen the mixture as it will be quite heavy at this point. Once loosened plop the remaining egg white into the mix and fold in carefully. I use a rough figure of eight motion combined with a forward scooping motion to best get the egg white in without knocking the air out. You may have a better way so use your own method. You don’t want any white showing. Pour the batter into the prepared tin and bake for 35-40 minutes until golden and well-risen. If it seems to be browning too quickly just cover it loosely with baking parchment. I have relied heavily on a recipe from the passionate cook for the proportions of this recipe (only adding in lime leaves, to be honest). I usually make curd on a larger scale and it was nice to find this less greedy-guts recipe. 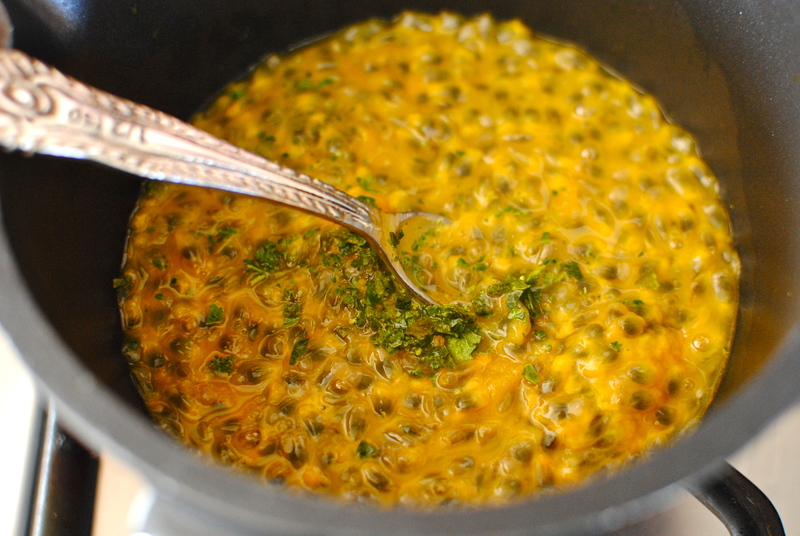 Pop the passionfruit pulp and seeds, along with the lime leaves, into a small saucepan; bring to a very gentle simmer for 10 minutes, stirring occasionally. This step allows the lime leaves to infuse. If you aren’t using the lime leaves, skip to the next step. 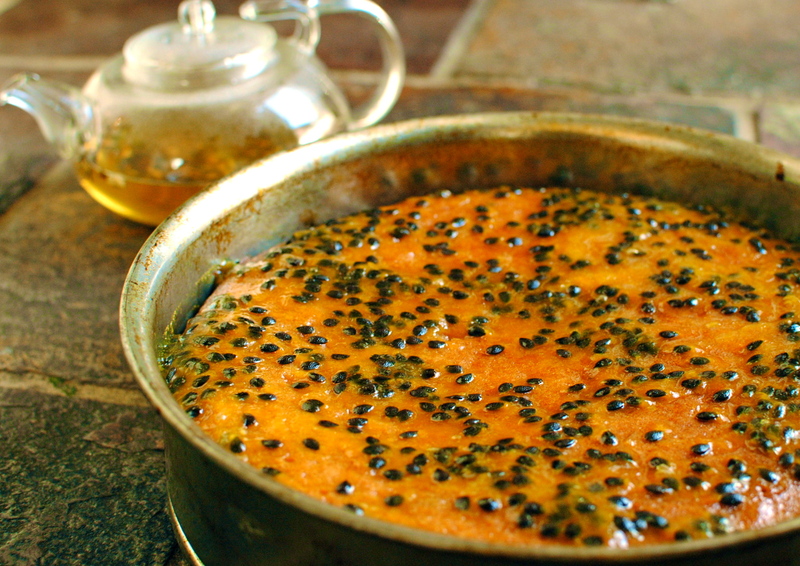 Now, scrape the passionfruit mix into a none-too-fine sieve set over a double boiler/metal bowl; press and stir the flesh against the sieve mesh, not forgetting to scrape any orangey bits clinging to the underside. Throw out the seeds, but retain one tablespoon if you like for a delicious crunch. Add the butter, sugar and beaten eggs to the passionfruit pulp and set the pan/bowl over simmering water. Whisk continuously until the curd has thickened to the consistency of thick cream – about 8 – 10 minutes. If the door bell goes, or the cat comes in with a mouse, ignore these distractions and keep whisking, otherwise you risk scrambled eggs. I have done it. Not nice to scrape my favourite fruit into the bin ☹. Pour the majority of the curd into a sterilised 454g/1 lb jar and use within one week. The remainder can go into a smaller pot and stuck in the freezer for future curd cravings; it doesn’t go solid so is absolutely fine to use almost straight from the freezer – wonderful swirled into plain vanilla ice cream! My goodness, what a FABULOUS post! The photos are sublime (haha!, subLIME, get it! ), stunning colours, absolutely mouth watering images and contains so many our family fav ingreds. I am definitely making this and perfect for our GF (gluten free), DF (dairy free) son. 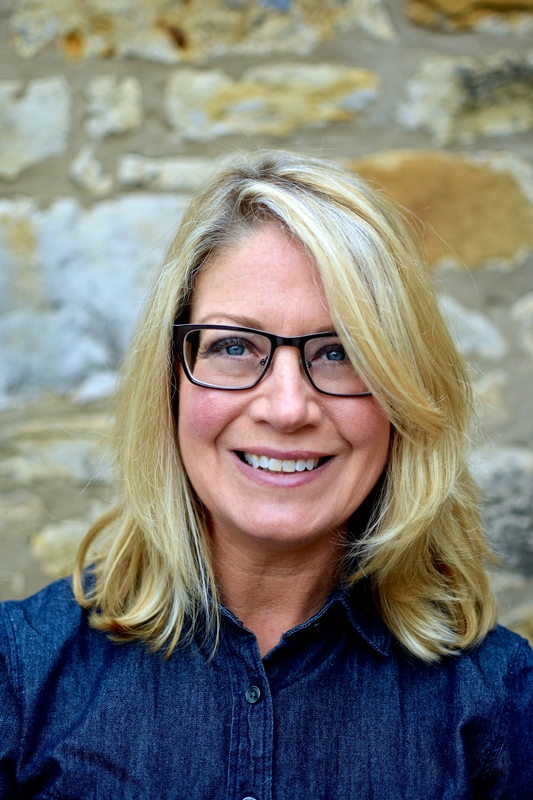 Love Rachel’s input on music, yet another reason to keep visiting this dynamic blog. ps the drink of the week sounds fab too. 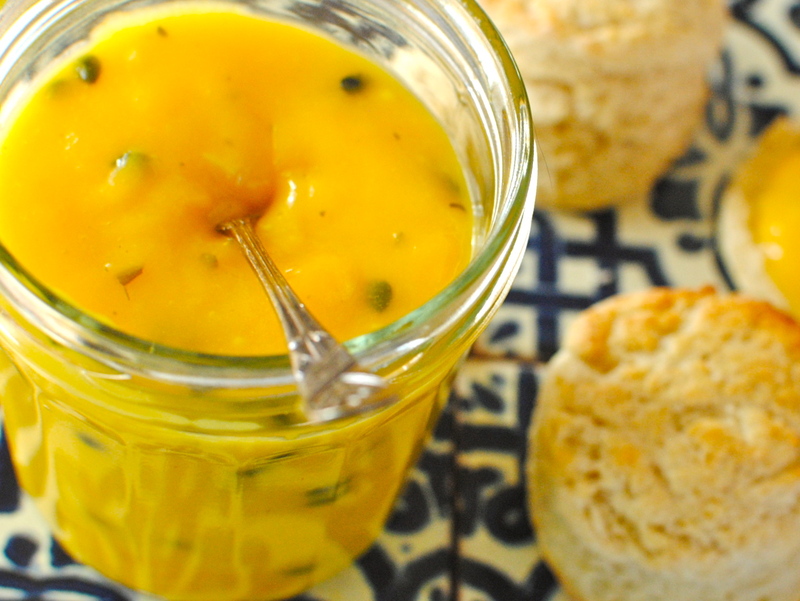 Although passion fruit are a bit pricy, I view them next to the price of a pot of yogurt and voila a value pudding. I give the family the choice, yogurt or passion fruit for ‘afters’ and they always say passion fruit. pps my sister has them draping over her fence in S.France and they get so many they cant even eat them all. Envy envy…. Fabulous cake Kellie, and I love that it’s naturally gluten-free! I just pinned this, so hope to make it soon! You and your daughter look like sisters 🙂 Have a wonderful weekend! I will take that as a compliment! And I’ve just started with Pinterest, at long last, & have been lurking amongst your boards to see how it’s done 😀 Thanks for pinning me. It’s super moist & zingy so I hope you do bake it sometime, although you’ve got so many gorgeous things pinned that mine will be in a long queue. 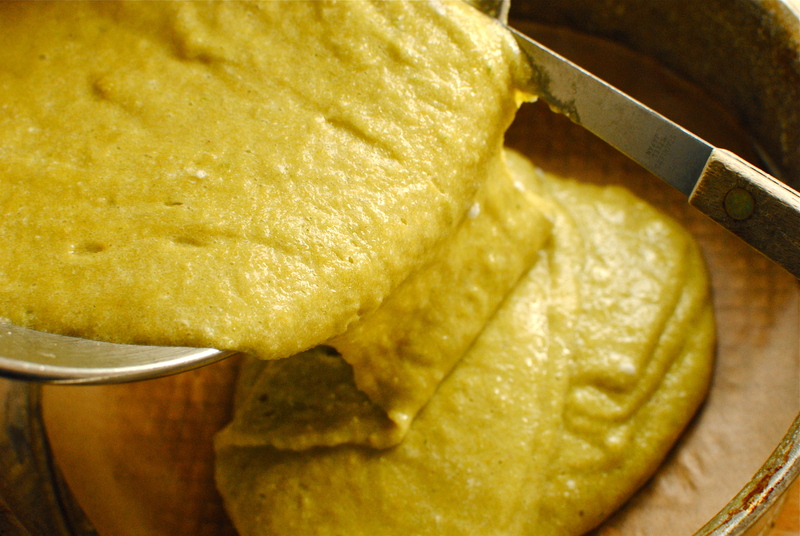 I love cooking and baking with polenta! i actually grew up eating polenta with strawberries for breakfast about once a week! I havent had it in ages and am thinking I should try and convince my boyfriend to like polenta. This recipe is definitely worth a try! looove passion fruit but usually stick to fruit that grow in the country that I live in. Local fruit just tastes so much better. m favourites are apples and Papaya and i definitely prefer them eaten on its own! Kellie, I saw the words passionfruit and lime and dived right in! Lovely! Such a beautiful combination. I am off grains at the moment, for health reasons, so polenta is out, just for a couple more weeks, but then I will try this one for sure. My favourite fruit? I love most fruit and must say that I just celebrate the seasons with the fruit each one brings… from apples to watermelon. Hi Lizzie! I think you could do this as all almond meal no problem, especially if you folded in the egg whites. Iight try this as I can only tolerate so much wheat as well. And I wish we could stick with seasonal fruit but we can’t grow citrus, melons, grapes (at least not widely enough), passion fruits – all the yummy fruits I miss from living on Florida. I envy you! You Antipodeans can have it all. Hi there ! I have a lot of food allergies restricted highly my diet but today your recipe looks like food ecstasy to my little brain !!! Oh my God it looks SO YUMMY !!! I wish I could have a slice of this delicious delicious scrumptious cake !!! Thanks for giving my brain cells a virtual shot of it ! Make it & be in ecstasy then! Go on, make time this weekend, & you’ll have gorgeous cake all week. Regardless, have a great weekend. Thank you! Hope you find the time to bake. I think you’ll like the taste as much as the look. I know your cake & you are right it is a tough decision naming it. Glad I’m not the only indecisive one. And you are so right about the tropical aroma. 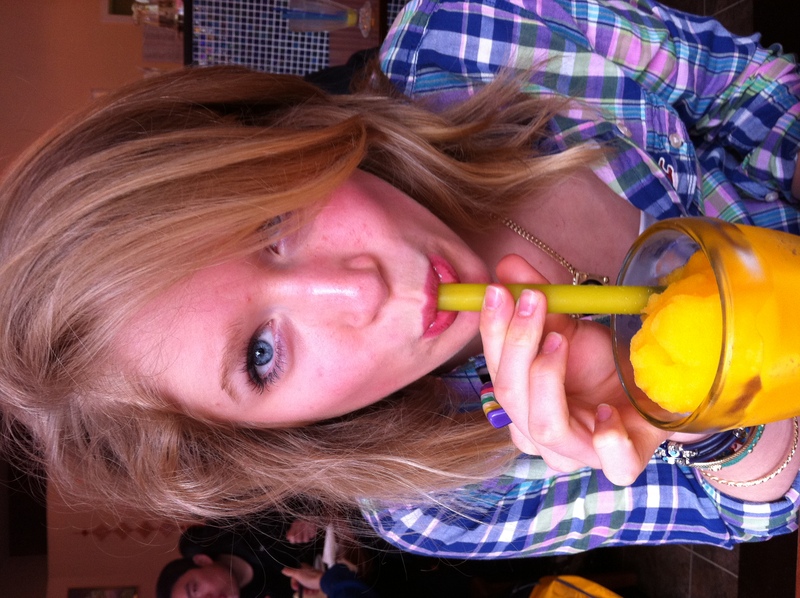 What a nice treat for nose & brain to simmer some passion fruits when the weather is foul. Not that you experience much of that Natalie! An enticing cake! 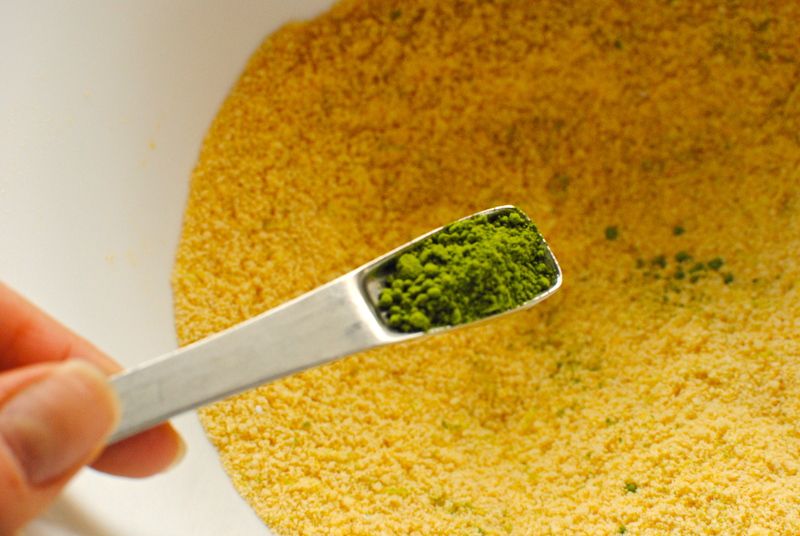 I purchased Matcha green tea powder to make French Macarons and have been looking for another recipe that could include this subtle yet fragrant ingredient. 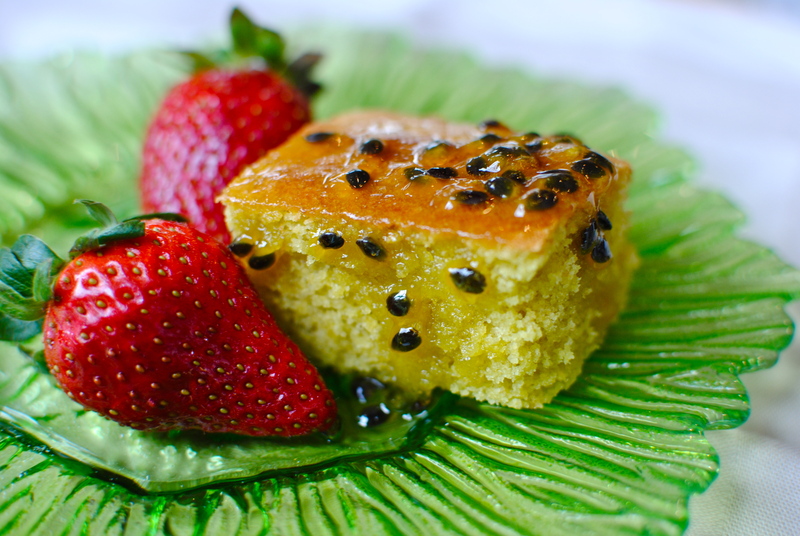 The passion fruit topping is irresistible! I had the pleasure of this cake on Mothers Day and can definately commend it to all and sundry. I have that Claudia Rosen Middle East Cook Book- very old and tea-stained and when I heard her with Jenny Murray on Womans Hour I immediately looked it out so you can borrow it! Yes please! Ive only got a couple of her paperback but not that definitive one. Btw, I’ve refined the cake since you tasted it (I’ve made it four times!) so when Bob’s rellies come in two weeks you will have the cake as written here. Doesn’t Claudia Roden sound lovely? Oh My! What a wonderful cake! This is on my to do list!!! I get mine (frozen) from the Chinese supermarket in Tollcross and keep in the freezer. Haven’t needed to buy them for a while as they do last, so I need to check they still stock them! Which Chinese grocer in Tollcross? And, did you make the cake/curd? as light as a rather home ec sponge. Hope you try the little trick. Thanks for visiting, Sally. PS I’ll look out Arctic’s cover of Love Machine! i had it and i loved it !!! Fantastic! Did you follow the recipe as is or did you make modifications? Hint: both answers are fine by me 😀 Thanks for letting me know that you made it. Now I know why I refuse to make most of my own meals. Preparing the ingredients can be a chore, and to make matters worse I am not that hungry when the food is ready. I love the look of the cake and will try my best to follow the directions. I made this cake for New Year’s but I must say that using the green tea produced a much greener cake than I expected. I’d expected a subtle “glow,” as written, but instead it looks almost fit for Halloween. I’m planning on topping it with the curd immediately before serving to tone down the ghoulish look. 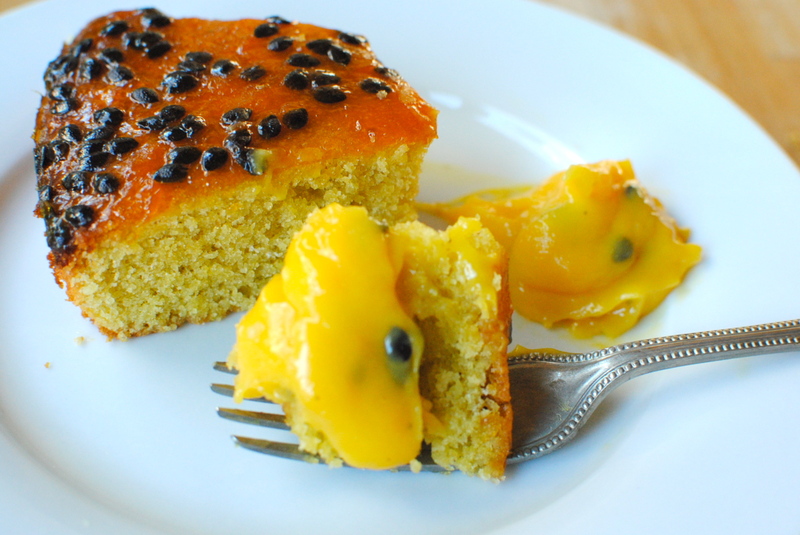 Oh, I couldn’t find fresh passion fruit, but I used Perfect Puree Passion Fruit concentrate, which seemed to work fine. I’m hoping it tastes great, but next time I won’t use the green tea — unless it’s Halloween!